autographed copy for him or her. 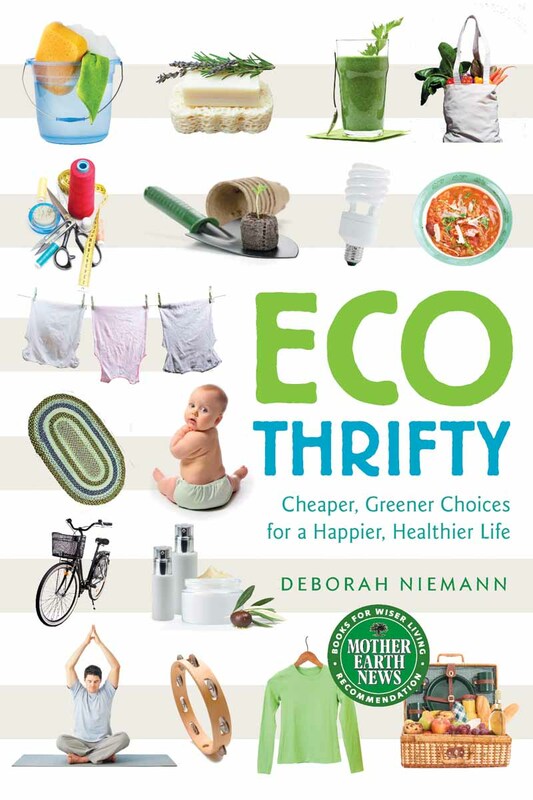 The book includes chapters on going green and saving money on personal care products, health and fitness, babies, clothing, food, your home, gardening, entertainment, and transportation. you want to tell us more, that’s great. I always love hearing about how people are trying to live cheaper, greener, healthier, and happier lives. them with a card letting them know whom to thank! Great give away Deborah!! Thank you! Would love to give a copy to my sister Pat, she has always lived frugally and thriftly. I know she would love having new and fresh ideas. I'd love a copy of this for my parents. My dad sometimes plants a small garden in the summer and tries to recycle plastic bottles, but other then that they aren't really very "green". I think this book might be a great way to show them that they can do more to live healthier and also help the environment at the same time. I would love to give a copy to my son and his family. I know they would probably use it every day. Thanks for the chance to enter and have a great week! Deborah, I would love to give this book to my parents. I have finally started persuading them to love a more frugal lifestyle but they have a long way to go yet and won't quite believe or take their kids' advice. This would be awesome inspiration for them. I have Homegrown and Handmade, and my friend Jill would LOVE the new book… she is green, green, green and will be moving to her own little 30 acres place in a few years. I'd love to win this book and give it to my friend. She's been looking of ways to save money and be environmentally friendly so it would be a great book for her. My friend Christine is already quite "Ecothrifty" but I've been meaning to lend her my copy so she could get some great new ideas – but a copy of her own for Christmas would be even better! I'd love to give a copy of this to a friend from church who is expecting her first child. She is looking at her upcoming role as a mother to make some positive changes in her home environment and financial life so this book would be a great gift! Thank you for the giveaway. I'd love this for my daughter who is getting ready to move away to start a new life on her own. I'd keep this to read and then probably pass it on to my mom. I would give it to my older sister Pam. She is always trying to find ways to live a little more simpler and less dependent on society. Thanks to everyone for entering! Using the random number generator at random.org, the number six came up, so Brandy Jones is the winner! Brandy, send me an email (deborah) at antiquity oaks dot com, and give me your parents name and address, and I'll send them a copy of Ecothrifty first thing Monday morning!